After Laurie Sanders ’88 led her small town near Smith in a drive to fund and build a new community library, she knew she’d need low-cost design assistance to make her shoestring budget work. 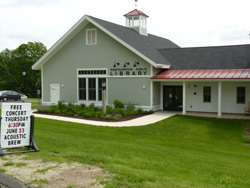 To the Westhampton Library rescue came a succession of Smith engineering students who, in consultation with Professor Paul Voss, researched design options with an eye toward keeping the building as energy efficient as possible. In a yearlong special studies course, Katie Mackenzie ’11, whose interest in energy efficiency was piqued in Engineering 100, picked up where two previous students left off. “I edited and wrote part of a computer program that used local weather and solar availability data to predict building energy use of the proposed building designs,” Mackenzie said. Like any engineering project, the hard part, then, was explaining the options to the client, in this case, members of the Westhampton library committee. “I found it best to take the results from the computer program inputs of the varying design changes and convert them into terms of fuel consumption and cost of operating the building,” she said. The Westhampton Public Library incorporated many of the students’ suggestions for window placement and size, Laurie Sanders said. “We oriented the new additions so that we increased passive solar gain and also have roof lines that work well for future solar panels,” Sanders said. The students’ recommendations helped the library qualify for a $20,000 grant from the local electric company, and the building is on track to receive LEED certification at either the gold or silver level, Sanders said. That certification will lead to a substantial state library grant that will be used to install solar panels.